My Buddy’s funniest habit : Wherever i go she follows and sits next to me. Raisen… never leave me alone..
She’s my friend, cant you see? Grooming parlours for pooches : because they are worth it! INBREEDING: please stop it for our sake!! Fat mum and fatty dad…no wonder kids are overweight – our pampered pooches in cities. Pets are inheriting the lifestyle sickness with their masters…and most of them are obese and have health problems related to over weight. While obesity invades people because of their busy lifestyle, idleness makes their pets fat. The nuclear family set up and busy working schedule prevents most of the people to give enough physical activity to their pets and themselves. Obesity brings with it ailments like liver problems, complaints of immobility and breathlessness, which can be highly harmful. Here comes the role of dog trainers and dog walkers, who give regular work-outs to pets. Busy pet parents in metros are now availing services of such people for the betterment of their canine kids. Our doggies are our love for life, but what after that? Have you ever given it a thought, what will happen to your pets if something happens to you? Well people like Bhawani Dutt Joshi defiantly do. An Utharanchal-based ex-military official, he gave off his entire wealth including retirement benefits to his two sons, Tikaram and Shivaraj. Before brushing aside this news, let me tell you that Tikaram and Shivaraj are his pet dogs! Even though Joshi had two wives, he could not father a child. And so, he showered all his love and affection on his two pet dogs. And now that he is old, he has formed a committee which would look after his pets after he dies. A true example of eternal love. Next time, when your pet hides himself, don’t worry. You can find him out easily in a high-tech way… like our Hollywood movies. Bing! Bing…locating doggies! A manufacturer of GPS equipment, Garmin, has developed a micro sensor device named Astro to sense motions and other additions to help owners to track their pets. Astro, which weighs two ounces, has two parts. One is a hand held GPS unit for the owner and the other device is meant to be put on the dog’s collar or harness. The unit on the dog’s collar computes the animal’s location from GPS satellites and radios the information to the owner’s hand-held unit. The dog units also have tiny motion-sensing chips that detect whether the dog is running, sitting or on point. Sounds great…well! hold on that’s not all. In Singapore, all the pets are tagged with microchips as well so that parents can trace their dogs easily…now pooch parenting has really become hitech, what say? Bow! retirement benefits for us too! The life after retirement might be a nightmare, if we don’t plan for it. Our serving pooches are worst victims of it. In the absence of proper care, old age becomes the sum total of discomfort and sorrows. But now, the dogs in Tamil Nadu Dog Squad will get a sigh of relief as they come under the pension scheme proposed by the state government. The dogs, after retiring from Dog Squad, were generally auctioned to pet lovers. But seeing the pathetic retirement life of these courageous and hardworking dogs, the government decided to give them a peaceful life by providing regular medical check up, diet and total care. Previously, when the dog reached retirement age, they were immediately sent out of the squad. But now, the scheme also allows them to stay in familiar surroundings and carry out routine exercise, so they can avoid the trauma of a sudden change of life style. A smart way for caring our dauntless canines! Yummy ice creams for us too! Scorching summer days and yummy ice cream treats…woof! We just love that. When we are slurping on delicious ice candies, our furry angels often pine for these mouth watery attractions. But not anymore as here’s good news for those who want to enjoy the hot summers with their beloved pets with a cup of ice cream. Pooches in Vienna, Austria are already slurping tasty ice creams at Iori, an ice cream parlour near St. Stephen’s Cathedral. Doggy ice creams are available in three flavours-vanilla, vanilla-rice and soy. After several months’ experiments, Anton Mramor-Leonardini, the owner of Iori, has developed these most suitable doggy ice creams. A sure way to pamper your canine’s taste buds! Every other day, we come across news of heinous activities conducted for making money. More recently, a few young men in Assam were caught for trafficking stray dogs to Nagaland. They paid Rs 50 per dog to the dogcatchers and later handed them over to the Naga traders for Rs 1000 for each dog, who use these dogs for food. Recently, People for Animals, under the leadership of Sangeeta Goswami, saved the life of 32 such stray dogs from death, after they came to know these canines had been confined and dumped at Uluoni forest by some local youths. A real encroachment to the life of the hapless! Let’s all unite to make this world a better place for our canine friends. Q : I just want to know that what would be the appropriate diet for my 50-day-old female Labrador. She also bites things around. What should I do? Dr. K.G. Umesh : Proper nutrition allows for puppy to reach his full genetic potential. Some dog owners prepare homemade foods for their pets. 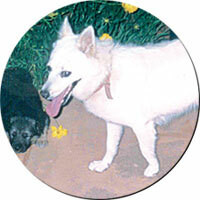 But it’s difficult even for an experienced breeder to get the nutritional balance just right. Remember that puppies grow approximately 12 times faster than baby and baby foods/home prepared diets do not meet nutrient requirements of puppies. The best idea is to get your puppy used to eating commercially prepared foods from the very start as they are designed to meet all their nutritional requirements. Also, it is normal for puppies to be “mouthie.” When she tries to bite, a GENTLE tap on the nose with a “NO BITE” command should be sufficient to correct this behaviour. Consistency is the key with puppies. When the pup stops the bad behaviour make sure you reward her with “GOOD (puppy’s name)!” Puppies want to make their owners happy and you need to help them by your voice tone when they are being good. Q : My dog had a wound, which is now cured, but there is no hair growth in that area. Why? Dr. K.G. Umesh : Hair growth cycle is influenced by many factors such as hormones, stress, nutrition, diseases and drug therapy. The wound might have destroyed hair follicles. Your vet may help you to find underlying cause. Q : My dog is probably pregnant. How do I confirm her pregnancy? Please advice me what care should be taken now, during birth and post birth. Also tell me about the pregnancy term. Dr. K.G. Umesh : The diagnosis of pregnancy (gestation period: 57–69, with average of 63 days)–may begin with abdominal palpation and then be more accurately diagnosed via ultrasonography or canine pregnancy kits. Late in gestation, the female requires increased amounts of a well-balanced, high-energy diet to meet the needs of the developing offspring as well as to enable her to produce enough milk for the offspring. Lactation may begin as early as 7 days prepartum in the pregnant female, but most females produce milk hours before they whelp. Her appetite may decrease and nest-building behaviour begins 24 to 36 hours before parturition. A reduction in her body temperature of about 1.1°F signifies that whelping is 12 to 24 hours away. A whelping box should be provided in a quiet, dimly lit area that is free of drafts. She should be left alone in the whelping box with free access to food and clean water and should be monitored as unobtrusively as possible. If a puppy is not born within 2 hours of the start of abdominal contractions (true labour), she may need medical attention. Consult your vet for further information. Q : I have a 12-weeks-old Labrador. Tell me about deworming and sterilisation schedule. Also, he does not like going out for a walk. What should I do? Dr. K.G. Umesh : Deworming is generally recommended every 2-3 weeks until 6 months of age and thereafter, once in 3 months. Your vet can advise you as to when it is best to have the neutering done (either puppy age or after sexual maturity). Puppies show increasing attraction to unusual things in their environment, and they learn what is and isn’t pleasing. If puppies are exposed in a non-frightening way to a wide variety of stimulating things during this period, they’re less likely to be afraid of new objects and situations later in life. Make sure that you have time to invest in an intensive socialisation programme during his early weeks with you that will have a long lasting effect on his behaviour. Q : How can I puppy-proof my home? Dr. K.G. 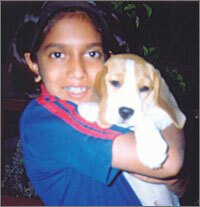 Umesh : Household items that you may consider harmless can be deadly to your puppy. He may tug or chew anything he finds including plants and electrical cords. Candles, burners, coins and similar objects can also be hazardous. Do not leave hazardous items, including medicines, poisonous plants, detergents and cleaning agents, where your puppy can get to them. Also, chocolates should be kept away from them. Make sure that all gates are shut securely and that your puppy cannot squeeze through or under your gate. Puppies soon learn that not everything in and around your home is for playing with and that some things are just not safe. In the meantime, do everything you can to ensure your puppy has a safe environment to grow up. All you kiddies out there, we would love to know more about you and your dog. Do write in your poems, short stories or anecdotes of your loving doggy and see them splash here. Here’s the checklist of information we would love to have and you can win a doggy gift hamper. A song you would like to dedicate for your Buddy : How much is that doggy at the window? What is the best trick I have taught him : Fetch the ball ! Dr. K.G. Umesh : A nutritionally balanced diet is crucial for the healthy growth and development of a puppy in order to prepare him for an active, long, and healthy life. Our research has indicated that most home made diets/baby foods fed to dogs in our country are inadequate and growth, development and body/skin condition may not be optimum. Puppies grow very fast, almost 12 times faster than a human baby. Puppies nutritional requirements are different from adults and is almost twice that of adults. Therefore, manufactured pet foods like Pedigree is developed and formulated specifically to meet all the requirements of dogs in different lifestages. Continue feeding puppy food until age of 6-8 months and switch over to adult pet food after that. Any dietary change should be made slowly to avoid any upsets to your pet’s digestion. Gradually introduce the manufactured pet food over a 5-10 day period by mixing very small amounts of the food with old diet. Make sure that fresh water is available at all times. Dr. K.G. Umesh : A generalised tick life cycle consists of egg, larva, nymph, and adult. The tick feeds once in each stage before maturing to the next stage. Ticks lay their eggs (as many as 18,000 in some species) in sheltered areas on or near the ground. Seed ticks hatch from the eggs and climb onto grass to wait for a suitable host. Successful control of ticks depends on eliminating these pests from the dog and the environment. To control ticks or fleas on a dog, all animals in the household must be part of the flea/ticks control programme. There are two basic categories of flea/ticks control products: Adulticides—these products kill adult fleas and Insect Growth Regulators (IGRs)/Insect Development Inhibitors (IDIs)—these products prevent fleas from hatching or maturing. Thorough cleaning of the house and yard should precede any application of insecticides. The veterinarian will choose a product or products that combine safety, efficacy, and ease of use for the client. Often a combination of adulticide and an IGR or IDI is used. Dr. K.G. Umesh : Considering his age and signs, all I can suggest is to take him to your vet to rule out common diseases like heart failure, COPD or tracheal collapse. Inflamed airways and kennel cough may also cause such symptoms. If he finds it difficult to breathe after walk, exercise/running etc, and the vet would consider heart problems like left side heart failure. Some dogs commonly have respiratory disease (i.e., collapsing trachea, COPD) coexistent with heart disease also. The best way to rule out all these diseases and to have specific treatment is get radiography, ECG and if possible echocardiography. Your vet might prescribe medications symptomatically till all the investigations are complete. Dr. K.G. Umesh : Otitis externa or inflammation of outer ear canal is common in dogs. Many factors can cause or contribute to the development of this ear problem in dogs. Parasites, foreign bodies, endocrine problems, allergies, etc can be a cause. Like wise ear structure (for e.g., floppy ears), errors in cleaning ears/medications predispose dog to develop this ear problem. Dogs with recurrent ear infections should be evaluated for flea allergy, atopy (pollens allergy), food allergy and yeast infections etc. Recognition of underlying causes and treatment of all the factors contributing to the ear infection are the key to successful clinical management. Do not use cotton tipped applicators to clean ears! Depending on severity and duration of ear infection, your vet may perform variety of tests from examination of discharge to radiography. Therefore, I suggest taking him to your vet as early as possible to find underlying cause and appropriate cleaning and medication protocol.